This piece originally appeared on Mosaic. In his 2008 tome The Bridge at the End of the World, James Gustave “Gus” Speth laid the blame for our planet’s predicament –– the vanishing fish and forests, the toxins in our water and our flesh, the runaway greenhouse gas emissions –– at the feet of capitalism. And the dirtiest deeds, wrote Speth, are performed by the free market’s mercenaries: outlandishly powerful corporations which, with their flagrant disregard for future generations and penchant for externalizing costs, are devouring our resources and impoverishing our citizenry. Far from preventing this tragedy, Speth claimed, environmental groups are complicit in it, their “pragmatic and incrementalist” approach incapable of producing the transformative changes that our planet needs. The Bridge at the End of the World pulled no punches in declaring capitalism the criminal, and environmental groups its abettors. The Bridge was heavier on diagnosis than prescription, but now Speth has written a new book, America the Possible –– a de facto sequel, which purports to offer creative solutions to our pressing problems. In The Bridge Speth posited that unfettered capitalism is ruining the world, and so it is incumbent upon America the Possible to tell us how the Invisible Hand can be made to serve humanity instead of pleasuring its masters. And what is required, says Speth, the co-founder of the Natural Resources Defense Council and the founder of the World Resources Institute, is no less than societal overhaul: “a new operating system that routinely delivers good results for people and planet at home and around the world.” No big deal, right? In the America of Good Results, we will achieve “basic social justice, real global security, environmental sustainability, true popular sovereignty, and economic democracy.” We will circumvent looming disasters like climate change and world war, learn to get by with fewer resources, and dethrone GDP in favor of more holistic measures of well-being. Our “materialistic, anthropocentric, and contempocentric” values will be replaced by a spiritual awakening and a new, sustainability-minded consciousness. The Kardashians will be exiled to the furthest corners of the galaxy, and their television airtime bequeathed to Wendell Berry, who will read excerpts from his essay collections to an enthralled public. Well, not the last one, but you get the idea. That glorious future is the destination, and Speth subsequently attempts to give us a map to help us get there. 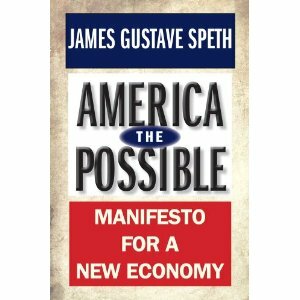 The author plays both dreamer and wonk, part Thoreau and part Thomas Friedman (albeit more liberal than the latter, more pragmatic than the former, and more clean-shaven than both), and in the book’s second half he marshals an impressive array of policies, proposals, and plans that, he claims, will steer us toward his just and sustainable vision. Speth has an encyclopedic knowledge of liberal think tanks and the white papers they produce, and the torrent of policy ideas that he unleashes is the book’s strongest aspect. He demands federal charters for corporations to ensure that companies achieve specific public purposes rather than running amok; urges that megabanks be dissolved in favor of community-scale financial institutions; and suggests adopting the Index of Sustainable Economic Welfare, a metric of well-being that, unlike GDP, subtracts negative costs such as the depletion of natural assets. He wants to drastically scale back the military, restrict personal income to no more than 100 times the salary of the average worker, and raise $3 trillion in revenue by eliminating loopholes and taxing enormous fortunes. Campaign finance is, fittingly, his favorite target; he wants to excise the money from elections by passing a law that prohibits candidates from accepting donations larger than $100. These are just a small fraction of his recommendations. Speth’s ideas might have been more persuasive had they included more examples of real people doing real things (e.g. living in alternative communities and forging new business models) instead of relying so heavily on policy theorizing. Still, his suggestions sound not only enticing, but, well, possible. “If some of these ideas seem radical today,” he writes, “wait until tomorrow. It will be clear before long that system change is not starry-eyed but the only way forward.” In other words, the fact that our country is now as hot and dry as the inside of a tandoori oven is inevitably going to catalyze action on carbon emissions. Given that American belief in, and fear of, climate change is now approaching its high-water mark, he may well be right. Speth lives and teaches in Vermont, and his ethic for governance feels quintessential to that state, which votes overwhelmingly Democrat in national elections, yet hosts a vibrant secessionist movement. He is a strong proponent of community control of enterprise and finance, and sounds, at times, almost like a member of the far right in his denunciation of our current governing bodies. But he also writes, “[Tea Party members] are wrong in not seeing that government can and must be a big part of the solution,” particularly when it comes to forcing companies to account for their social and environmental externalities. Local economies plus occasional (though forceful) government action to prevent corporatocracy: that’s America the Possible in a nutshell, and it sounds like a nice place to live. Of course, our sclerotic politics have made passing any legislation, let alone such a progressive package of laws, basically impossible –– so how, short of a Bernie Sanders-led coup d’etat, are any of these bright ideas going to get implemented? Marches, protests, and acts of civil disobedience will have to spring forth, treading upon the path broken by Occupy Wall Street. Most of all, heretofore disparate groups will have to find each other: “Clearly, the walls separating social justice liberals and environmentalists must be breached,” ideally through the creation of green jobs. Speth is hardly the first person to arrive at the green jobs party –– heck, even Chris Christie now acknowledgessolar energy’s job-creating potential –– and Speth’s rallying cry might have been more powerful if he had answered some pertinent and practical questions (what specific industries are most promising, for example, and in which states?) rather than reiterating Van Jones’ rhetoric. Still, he’s right that liberals need a faction-crossing Big Idea; and given that middle-class environmental employment is one of the few sectors actually experiencing growth, a green jobs platform looks like a stronger political strategy than ever. Still, not even the greenest of jobs can heal our ill culture, and the commodity fetishism so ingrained in it that our greatest intellectual hero is a guy who made attractive cell-phones. Speth claims that “environmentalists have been too wonkish and too focused on technical fixes… Now we need to hear more from the preachers, the poets, the psychologists, and the philosophers.” Yet I fear that changing cultural values is so difficult and gradual, and our problems are so pressing, that we have no choice but to lean on technical fixes –– all we can do is code environmental values into our laws and our corporations, and drag consumers along for the ride. Gus Speth may believe that building a better world calls for better preachers, but his book makes a compelling argument that our fates lie with the policy wonks. Ben Goldfarb is a freelance writer whose work has appeared in The Guardian, OnEarth Magazine, Earth Island Journal, and elsewhere. He is a former Editor-in-Chief of SAGE Magazine. Check out his writing at www.bengoldfarb.com and hit him up at @bengoldfarb13. Laws and policies play a crucial role in driving changes in societal values, and of course wonks have an indispensable and incredibly important role to play in tackling our wickedly complex environmental problems, but the wonks won’t even get the chance to step up to the plate without the preachers. What good are a million white papers on what comprehensive climate legislation should look like if we never get the actual bill due to a lack of political will?